Chicken is a staple at my house. During the summer, we usually grill it. I also have several slow cooker recipes that I make often. Once it cools down, Honey Glazed Baked Chicken is a huge favorite. When the kids were growing up, I made this chicken often, especially during the fall and winter. It’s a great dish to prepare on a weeknight. It’s also perfect if you have company coming over. My Honey Glazed Baked Chicken cooks for a while in the oven, so I rarely make it during the summer. It’s just too hot here in South Carolina to have the oven on for that long on a summer day. This is definitely a fall and winter dish. Honey Glazed Baked Chicken is perfect on a cold winter day. And I can’t begin to describe the amazing aroma. 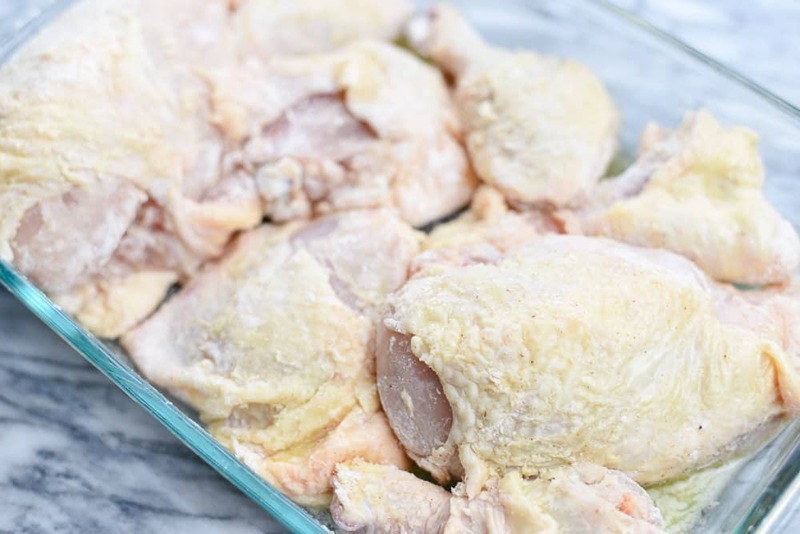 The smell coming from the oven while this chicken is baking will make you so hungry! My family also thinks my Honey Glazed Baked Chicken is amazing. The chicken is tender, flavorful and crispy. I hope you like it too! Combine flour, salt, and cayenne pepper. Add chicken pieces and coat with flour mixture. Pour 4 Tablespoons of butter into a 13x9x2-inch baking pan. 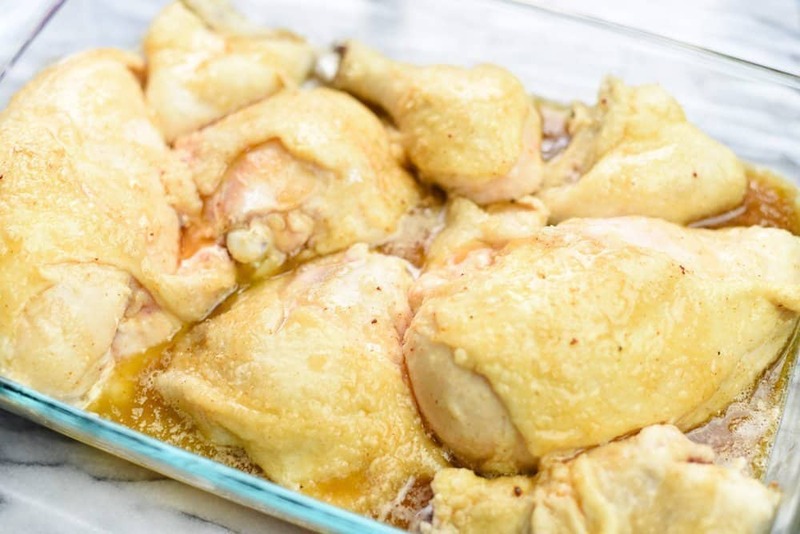 Place chicken in pan, turning once to coat on both sides. Bake, uncovered, at 350º for 30 minutes. Combine brown sugar, honey, soy sauce, lemon juice, curry powder, and remaining melted butter. Pour over chicken. Bake for an additional 45 minutes or until chicken is tender, basting several times with the pan drippings. In a bowl, combine flour, salt and cayenne pepper. Add chicken pieces and dredge to coat. Place 4 Tablespoons melted butter into a 13x9x2 baking pan. Pace chicken in pan, turning pieces once to coat in butter. Bake, uncovered, at 350º for 30 minutes. Combine brown sugar, honey, soy sauce, lemon juice, curry powder and remaining butter. Pour over chicken. Bake 45 minutes longer or until chicken is tender, basting several times with pan drippings. Julienne five large carrots. Place carrots in a saucepan, cover with water and cook until tender, about 8-10 minutes. Drain. Combine butter, sugar, salt, and cinnamon. Pour over carrots and toss to coat. If you’re looking for a new chicken recipe, Honey Glazed Baked Chicken is a winner. Try it and let me know what you think. We eat a bunch of chicken every week and this one looks like a keeper as my husband would say. 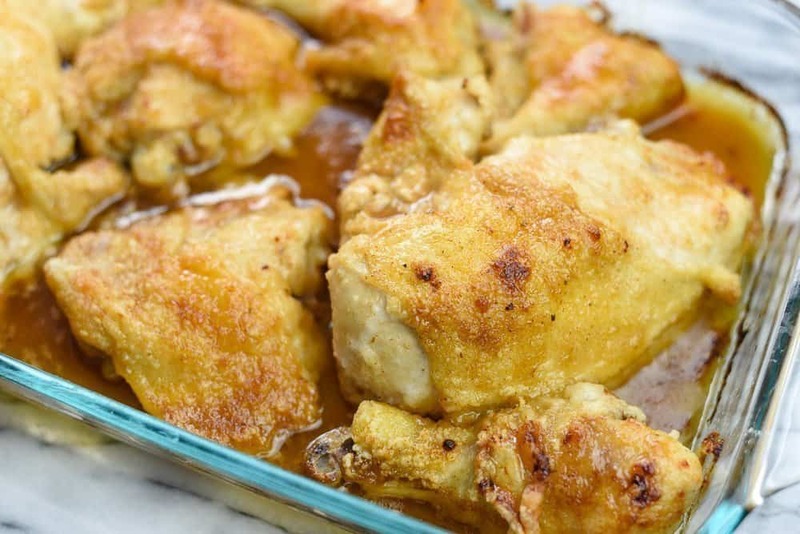 Honey glazed baked chicken is perfect meal for my family. I’ve always enjoyed chicken! This sounds like a fabulous flavor. I’ll have to make it for dinner soon. This looks like a great meal for the fall and winter real comforting. It would be a meal you can make for your family and the leftovers perfect for lunch. This is amazing. Look at that crispy skin? I need to know the secret to that. I love the flavors of the honey on the glaze. I love baked chicken. This looks and sounds delicious. I’ll have to give this recipe a try. I love trying new chicken recipes. My kids get sick of the same ole bbq chicken pretty fast. I love that it’s got slightly crispy skin. MY FAVE! This chicken recipe sounds delicious. I sometimes love a sweet glaze on my chicken and this looks perfect. I’ll keep this recipe in mind for later in the fall. i am always looking for new chicken recipes and this looks pretty simple to make and delicious. I also love the carrot recipe. Its my goal to eat more vegetables so I will give your recipe a whirl! This chicken dish looks absolutely fantastic! The flavors sound great and that crispy skin would be a hit for sure. We can never get enough chicken recipes and this one sure looks like one we’d enjoy. The glazed carrots sound yummy too. This recipe looks delicious and easy to make. I try to cook chicken at least once a week, but I can get tired of doing it the same way over and over, so this is a great new option. This looks like a great chicken recipe! I feel like I always make chicken the same one or two ways, this is a new one for me to try. Thanks for the idea! We always buy chicken in bulk in our household and sometimes, it’s so hard to think of recipe ideas. 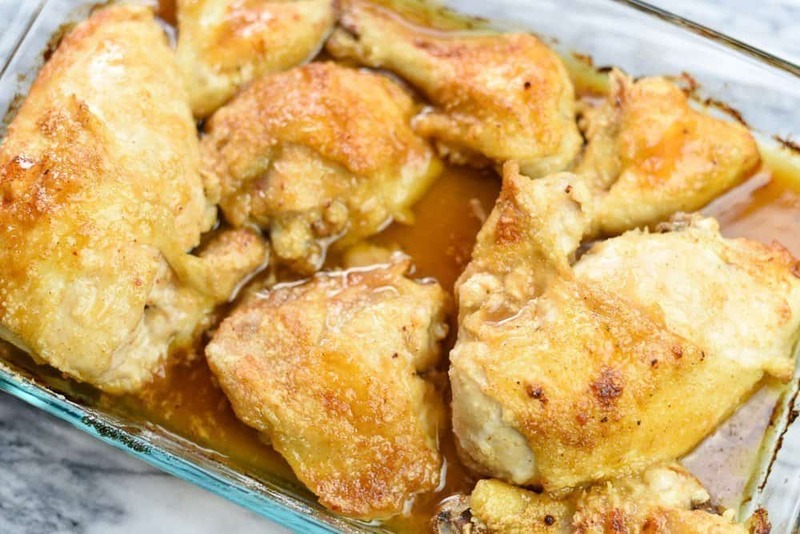 You Honey Glazed Baked Chicken is something I would love to try. I made a lot of baked chicken recipes because the kids prefer chicken over anything. I bet this recipe would go over really well here. I’ll save the recipe to try it. Now this is how you make chicken! Honey glaze sticks to it so well; great recipe! That looks delicious, a dish that my family would love. I would like to try your recipe. Chicken is pretty much all I eat and this honey glazed chicken sounds AMAZING!! I need to try this recipe ASAP!! I would love to make this recipe at home, it’s such a delicious meal. I also appreciate the fact that it’s baked and not fried. Thanks for the recipe! This is a perfect menu for the next weekend. I have never make this and I guess this is the perfect time to try it out. Making the best of me by practicing different menus.